The Amazing Shoe Steals on Amazon Fashion Right Now! One of my favorite pastimes is hunting Amazon Fashion for amazing deals — and there are plenty to be had! If you’re willing to wait just a few months after an item first comes out you can find incredible savings on name brand and luxury items. Suddenly the phrase “so last season” takes on a new, much more positive connotation! All of my picks are still right on-trend or have classic, timeless appeal. You’ll be smiling to yourself all day as the compliments roll in and you’ve spent so much less than other people did just a month or two ago. While I certainly don’t mind spending money on a high-quality item, if there’s a deal to be had why miss out on it? That’s my feeling on hunting around Amazon’s extensive fashion choices. Because Amazon has multiple huge warehouses they can afford to hold onto items longer. So if an item is selling very well they can keep it at full price longer. Conversely, when an item isn’t selling or is just older they start cutting the prices to move items. This works to our advantage as patient shoppers! I’ve watched items I want tumble from over $300 down into the low $30s and on down. This is how you can find Dolce Vita’s Effie sandal (from $68), one of the most popular sandals this Summer (see it styled multiple ways in this post), now at over 50% off. Amazon Fashion wants to move that stock. Today I want to show some amazing deal examples from a couple of my favorite shoe brands. In the lists below you’ll find tall boots starting at just $11 and plenty of cute fall-ready shoes from as low as $25. Of course these amazing deals often mean there are very limited sizes available. You never know when that total steal will be your size! 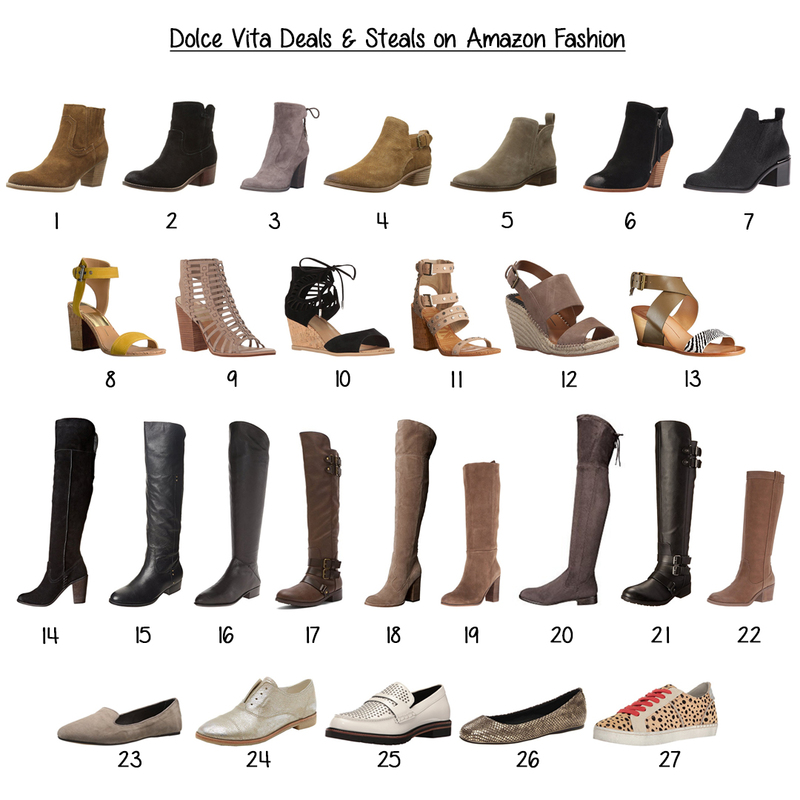 First up is Dolce Vita, one of my reliable brands for beautiful boots and sandals. I tend not to buy their heels because I find they have little arch support. Their wedges however are great. Below are some of the best deals on Dolce Vita you can find right now on Amazon Fashion. You can see even more Dolce Vita shoe deals here. Fun, isn’t it? Shall we play the hunting game one more time? This time, below are deals from Sam Edelman, another favorite shoe brand of mine. Their pumps are sturdy, stable and comfy and their sandals and boots are some of my favorites! 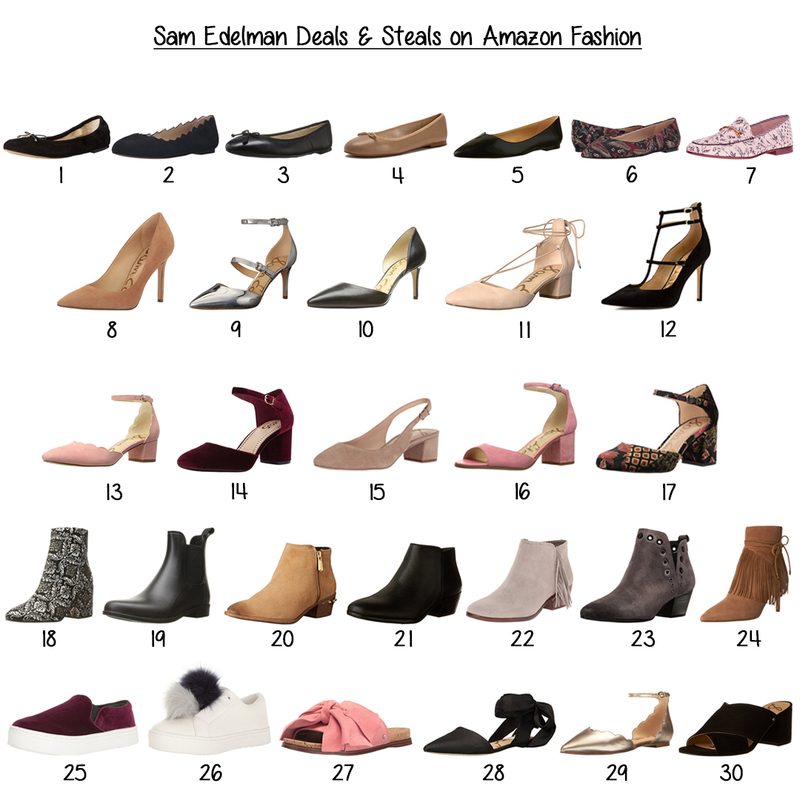 You’ll find more great deals on Sam Edelman shoes via Amazon Fashion here. If you’re looking for more fashion steals from Amazon, I covered clothing steals (and several more cute pairs of shoes!) in this recent tutorial post, and picked more of my Fall favorite shoes here. I’d love to know — what are some of the best deals you’ve found on Amazon Fashion? Let us know your tips & tricks! Ahhh how could you know that White Oxfords was on my wishlist! Anthro has a pair for $400 ‼️ and they won't make it to sale. Target has a gorgeous pair for less than $40 bucks but in black only. So now thanks to you I'm putting the Aidan Oxford's in my cart 😀 Thanks Roxy! I love all the Dolce Vita options! I never look on Amazon for shoes. #14 and #24 from dolce vita are fab! Those are both fantastic picks! Ok I want all of these! Lol super cute picks! I love Amazon and these deals are seriously awesome! I love Dolce Vita shoes! I never think to check Amazon for fashion but I need to start if they have all these deals. I felt the exact same until about a year ago…now I make it more of a point to go there because they often beat other retailer's prices, with free shipping and free returns. Of course being their partner also helps! What a great post! I've been wanting the Sam Edelman Petty Ankle Boot in black for a long time and just bought them from Amazon thanks to you! Thank you! I love it Christina N!! Amazon is the best!!! Love the Petty boot. It's such a cute shoe! I love all of these picks! Amazon is amazing! They do have an incredible selection. So many great deals! Dying to stock up! I got two pairs of Kate Spade Yasmin pumps on Amazon this week for under $100 each. I saw an loved them last year but just couldn't justify the $250+ price tag, so I was delighted to find them more reasonable now. WOW. My jaw is on the floor, what a great deal! I really like these Kate Spade pumps: http://amzn.to/2vYtztN the Lydia, but I really hope they come back in the leopard print. I only just now discovered Amazon for fashion and I love it!! they def have the best deals!! Agreed, depending on the time of year! I love it lol! Hope you found some great stuff. Love it! They really do. omg these are great deals! need to shop amazon more often! It's lots of fun hunting, that's for sure. Great post! I always forget to shop for any clothing items on Amazon! There are so many gorgeous shoes!! I always forget Amazon sells fashion now! So many amazing shoes!!! I see so many I might need to add to my closet! I LOVE finding shoes on Amazon that are sold out from my other favorite retailers! Amazon has so many great shoes! Amazon fashion is the BEST! I need some of those boots! Amazon never fails to amaze me with their awesome fashion section! Love these picks! I recently got a pair of shoes from Amazon that I absolutely adore (and have already worn too many times, so they're starting to wear … oops haha) I gotta get my hands on some more of these great deals!